Google Pixel 3 XL will be released just a couple of months later from now. 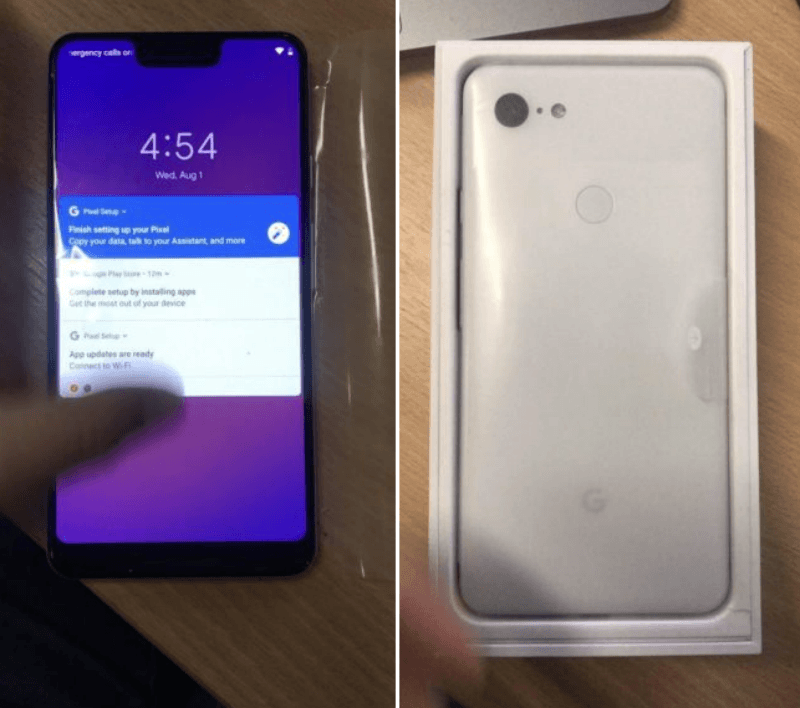 Ahead of the release, the images of the first production unit of Pixel 3 XL have been posted online. The ‘Clearly White’ Pixel 3 XL, as you can see, in the images doesn’t differ much in terms of design when compared to last year’s Pixel 2 XL. That said, these new images of the device match the earlier leaked Clearly White images of the Pixel 3 XL, so this could be the final design of the smartphone. If this is the final design, then there’s a massive disappointment for the users as the Pixel 3 devices will also sport a single rear camera, like the Pixel 2 series. A Russian tech blogger shared these images of the Pixel 3 XL on his Telegram channel. As we saw from the CAD renders in the past, the Pixel 3 XL will have a massive notch on the front, sitting on top of the 6.2-inch Quad HD+ display. The Pixel 3, on the other hand, will have a smaller 5.3-inch display with no notch presence. The photos are clear enough and as you can see the pixel density of the display is 494 PPI. 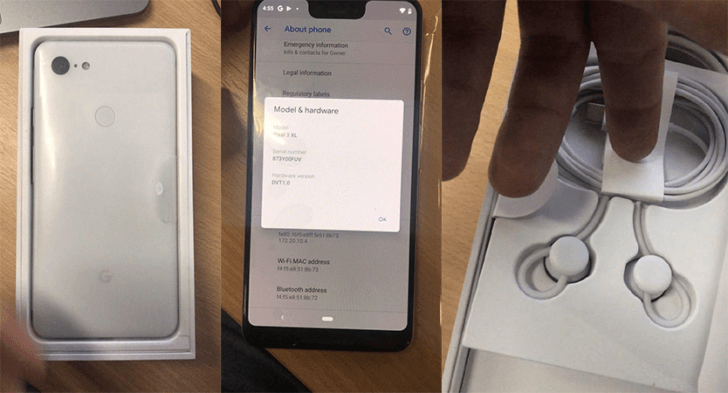 Earlier this month, the Pixel 3 XL paid a visit to benchmarking portal Geekbench revealing the complete specifications of the handset. The Pixel 3 XL will run Android 9 Pie out of the box, comes powered by the Snapdragon 845 SoC and worryingly, it will come with just 4GB of RAM. The resolution of the display, as seen on today’s leak is 1440×2960 pixels. Another interesting aspect of today’s leak is the images of wired USB Type-C earbuds which might come bundled inside the retail box. In the past, several Pixel 2 XL users complained that their retail box had a massive empty space, which seemingly belonged to the cancelled earbuds. But this time around, Google doesn’t seem to scrap the project and indeed the Pixel 3 devices could come bundled with USB-C earbuds inside the box. Notably, this confirms that Google is not going to bring back the 3.5mm headphone jack. With Android 9 Pie, Google officially supports notch design, hinting at the notch presence on its own devices. According to today’s images, the notch on the Pixel 3 XL seems to be a bigger one in terms of height than the ones present on the OnePlus 6 and Apple iPhone X. It will be interesting to see what the Pixel 3 devices has in store for us. The launch event is reportedly scheduled for October 4. 4GB RAM is a shame. Google should launch pixel 3 XL in India with bundled offer at discounted price from day 1.